Welcome to hump day! The kids are on spring break and it has been a tough one for many in our county. On Monday a 4-H Leader and 3 teenage girls were in a major car accident. One of the girls did not survive. So if you looked at my blog yesterday and wondered why it was one with few words... That is why. My heart is so heavy. My thoughts and prayers go out to the young girls family and all of the kids that this is effecting. My only thought when a tragedy like this strikes is that we as parents never plan on out living our own kids. Our time here is not guaranteed. I am not sure that our teenagers will be able to comprehend that or know how to come to terms with this. Prayers for the other 3 in the vehicle. Two remain the hospital with many injuries and surgeries in the future. Now to lighten the mood. Today I am designing for the Paper Craft Crew Design Team and you will see that I didn't take this sketch to literally! 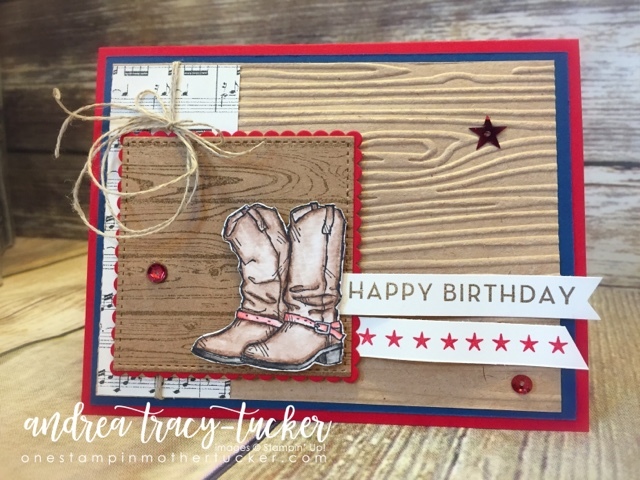 My fun card started with my water colored boots from Country Livin. I used our amazing Water Color Pencils to color up these cuties and I think I finally got the hang of them. I then added them to a lovely Kraft Stamped Hardwood base with a Real Red Scalloped Square. The music paper from the "This Christmas" DSP seemed appropriate for my country themed card. What is a cowboy card without a lariat! My lariat was made using linen thread. A Happy Birthday sentiment from Big On Birthdays a few Real Red Sequins and this Cowboy was done!